Spanish Crown Prince Felipe and his wife Letizia Ortiz, Princess of Asturias, pose for photographers at Madrid's Royal Palace, May 22, 2004. Their televised wedding ceremony was beamed to more than a billion people worldwide. 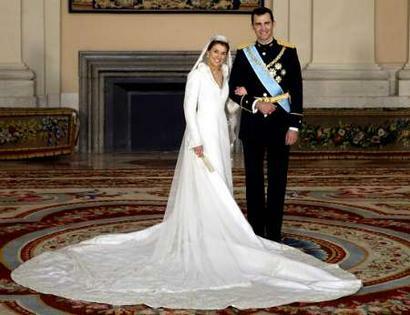 Long one of Europe's most eligible royals, Felipe looked outside the ranks of royalty for his bride. He chose a 31-year-old divorcee who was a rising star for Spain's most popular news broadcaster before saying yes to a proposal that will make her queen of Spain some day. It was Madrid's first royal wedding since 1906.